This report describes results from a groundwater data-collection program completed in 2003–2004 by the U.S. Geological Survey in support of the South Platte Decision Support System and in cooperation with the Colorado Water Conservation Board. Two monitoring wells were installed adjacent to existing water-table monitoring wells. These wells were installed as well pairs with existing wells to characterize the hydraulic properties of the alluvial aquifer and shallow Denver Formation sandstone aquifer in and near the Lost Creek Designated Ground Water Basin. Single-well tests were performed in the 2 newly installed wells and 12 selected existing monitoring wells. Sediment particle size was analyzed for samples collected from the screened interval depths of each of the 14 wells. Hydraulic-conductivity and transmissivity values were calculated after the completion of single-well tests on each of the selected wells. Recovering water-level data from the single-well tests were analyzed using the Bouwer and Rice method because test data most closely resembled those obtained from traditional slug tests. Results from the single-well test analyses for the alluvial aquifer indicate a median hydraulic-conductivity value of 3.8 x 10-5 feet per second and geometric mean hydraulic-conductivity value of 3.4 x 10-5 feet per second. Median and geometric mean transmissivity values in the alluvial aquifer were 8.6 x 10-4 feet squared per second and 4.9 x 10-4 feet squared per second, respectively. Single-well test results for the shallow Denver Formation sandstone aquifer indicate a median hydraulic-conductivity value of 5.4 x 10-6 feet per second and geometric mean value of 4.9 x 10-6 feet per second. Median and geometric mean transmissivity values for the shallow Denver Formation sandstone aquifer were 4.0 x 10-5 feet squared per second and 5.9 x 10-5 feet squared per second, respectively. Hydraulic-conductivity values for the alluvial aquifer in and near the Lost Creek Designated Ground Water Basin generally were greater than hydraulic-conductivity values for the Denver Formation sandstone aquifer and less than hydraulic-conductivity values for the alluvial aquifer along the main stem of the South Platte River Basin reported by previous studies. Particle sizes were analyzed for a total of 14 samples of material representative of the screened interval in each of the 14 wells tested in this study. Of the 14 samples collected, 8 samples represent the alluvial aquifer and 6 samples represent the Denver Formation sandstone aquifer in and near the Lost Creek Designated Ground Water Basin. The sampled alluvial aquifer material generally contained a greater percentage of large particles (larger than 0.5 mm) than the sampled sandstone aquifer material. Alternatively, the sampled sandstone aquifer material generally contained a greater percentage of fine particles (smaller than 0.5 mm) than the sampled alluvial aquifer material consistent with the finding that the alluvial aquifer is more conductive than the sandstone aquifer in the vicinity of the Lost Creek Designated Ground Water Basin. 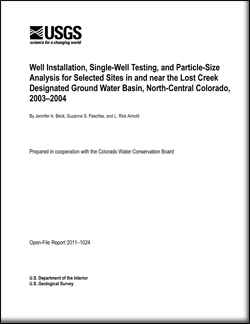 Beck, J.A., Paschke, S.S., and Arnold, L.R., 2011, Well installation, single-well testing, and particle-size analysis for selected sites in and near the Lost Creek Designated Ground Water Basin, north-central Colorado, 2003–2004: U.S. Geological Survey Open-File Report 2011–1024, 23 p.